I've been already several times to Melange Chocolate, which is located in Peckham. Peckham you say? Well it's not as scary as you imagine and actually the shop is located about equal distance from East Dulwich rail station and coming that way you walk in leafy roads of suburbia. Isabelle the owner of the shop runs this monthly interesting evening. We start by introducing ourselves and it was nice interesting to find how we all come from different backgrounds. A director, a teacher, IT guy (myself), someone who works in the police and financial investigator and Isabelle the chocolatier. Isabelle starts by introducing us to the chocolate and how it is made and then she introduces us to the wine she picked for us. Isabelle told me that sometimes people bring their own wine, which makes it more interesting as she needs to sit and try to understand which wine match better which chocolate. We first had the chocolate and after it starts melting we had the wine. 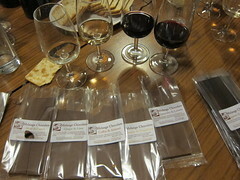 It is interesting to realise how some wine compliments very well the chocolate depends on the flavour of the chocolate. For example for one of the wines the lime or lemon made all the difference. Probably it was the acidity that comes with those citrus fruit and the acidity in the wine. I would recommend this evening to any chocolate and wine lover.